Leica Gallery Istanbul is pleased to host the world reowned photographer Hellen van Meene’s first exhibition in İstanbul as a part of 212 Photography Festival in collaboration with bomontiada and with the support of Consulate General of the Kingdom of The Netherlands in Istanbul. Over the last twenty years, Hellen van Meene has produced a complex body of work, offering a contemporary take on photographic portraiture. Characterized by her exquisite use of light, formal elegance, and palpable psychological tension, her depictions of girls and boys on the cusp of adulthood demonstrate a clear aesthetic lineage to seventeenth-century Dutch painting. Van Meene’s unique style is characterized by the timeless and mysterious atmosphere in her images and by her consistent use of natural light. Due to the crucial importance of lighting in her photographs, but also because of the particular way she stages her pictures of adolescent girls, her work is sometimes compared with that of major painters of the past, from Botticelli and Velázquez through to the Pre-Raphaelites of the nineteenth century. Van Meene draws her models – often young girls – from her immediate social circle or spots them on the street. She does not care who the girl is or where she comes from. For that reason, she deliberately refrains from titling her photographs; the identity of the subject is irrelevant. The photographic image represents a mere moment in time, carefully staged by the photographer; the subject may look quite different the next day – especially if she is a girl in an ‘in-between phase’, hovering on the brink of adulthood. Time flies by. What remains is a timeless image that frequently offers no clue as to whether it was produced at the start of Van Meene’s career or just this year. 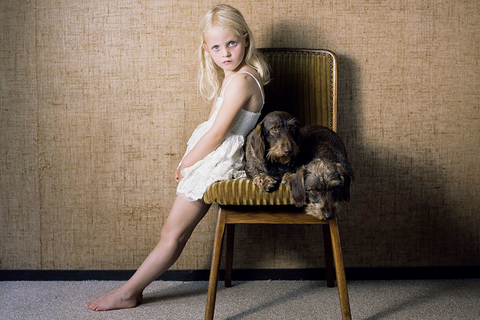 Artist Hellen van Meene (Alkmaar, Netherlands, 1972) is known for her (mostly) square photographic portraits of teenage girls. Her work was first exhibited in 1996 and has been shown around the World since then. Van Meene’s work has been exhibited internationally, including at Guggenheim Museum, New York; Van Gogh Museum, Amsterdam; Folkwang Museum, Essen; Museum of Contemporary Photography, Chicago; The Photographer’s Gallery, London; Whitechapel Gallery, London; Huis Marseille, Amsterdam; Istanbul Museum of Modern Art; Brooklyn Museum, New York; and The Art Institute of Chicago. Van Meene’s works is held in the collections of major museums worldwide including the Guggenheim Museum, New York; Stedelijk Museum, Amsterdam; Victoria & Albert Museum, London; Art Institute of Chicago; Brooklyn Museum, New York; MoCA Los Angeles; and the San Francisco Museum of Modern Art.